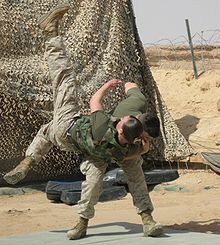 The Marine Corps Martial Arts Program is a combat system developed by the United States Marine Corps to combine existing and new hand-to-hand and close quarters combat (CQC) techniques with morale and team-building functions and instruction in the Warrior Ethos. 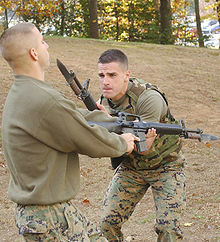 The program, which began in 2001, trains Marines (and U.S. Navy personnel attached to Marine units) in unarmed combat, edged weapons, weapons of opportunity, and rifle and bayonet techniques. It also stresses mental and character development, including the responsible use of force, leadership, and teamwork. 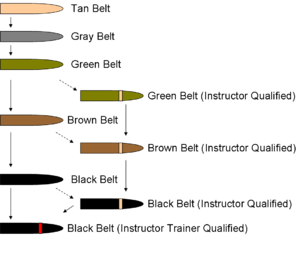 During World War I these bayonet techniques were supplemented with unarmed combat techniques, which often proved useful in trench warfare. Between the world wars, Colonel Anthony J. Biddle began the creation of standardized bayonet and close combat techniques based on boxing, wrestling, and fencing. 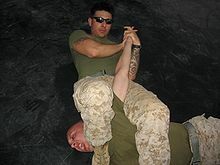 Also during this period, Captains Wallace M. Greene and Samuel B. Griffith learned martial arts techniques from Chinese American Marines and brought this knowledge to other Marines throughout the Marine Corps. In 1956, at Marine Corps Recruit Depot San Diego, Lieutenant Colonel Ralph Hayward (captain of the judo team at MCRD) made Gunnery Sergeant Bill Miller the new Non-Commissioned Officer in Charge of Hand-To-Hand Combat. Miller was ordered to develop a new curriculum that a 110- or a 210-pound Marine could use to quickly kill the enemy. Miller created the program from various martial arts styles such as Okinawan karate, judo, and jujutsu. Every Marine recruit that went through MCRD was instructed in Miller's Combat Curriculum. This also included Special Operations Forces from all branches of the military and civilian entities. Later in 2001, retired Gunnery Sergeant Bill Miller was awarded the Black Belt Emeritus "for pioneering Martial Arts in the United States Marine Corps." Eventually these different techniques evolved into the LINE System in the early 1980s. Later, the system was found to be lacking in flexibility and techniques for use in situations that did not require lethal force, such as peacekeeping operations. The Marine Corps began searching for a more effective system. The result was the Marine Corps Close Combat training Program implemented in 1997–1999. MCMAP was implemented as part of a Commandant of the Marine Corps initiative in summer 2000. Commandant James L. Jones assigned Lieutenant Colonel George Bristol and Master Gunnery Sergeant Cardo Urso, with almost 70 years of martial arts experience between them, to establish the MCMAP curriculum to be taught at the Martial Arts Center of Excellence (MACE). Tan belt, the lowest color belt and conducted during entry level training, signifies the basic understanding of the mental, physical, and character disciplines. It is the minimum requirement of all Marines with a training time of 27.5 hours and has no prerequisites. Recruits receive these belts after completion of a practical application test on all of the basic techniques of the Tan Belt. Gray belt is the second belt attained after 46 hours of training. It signifies an intermediate understanding of the basic disciplines. The Marine must complete the "Leading Marines" course from the Marine Corps Institute, and most instructors will require a report be completed on the Marine Raiders. Green belt is the third belt, requiring 55 hours of training. This belt signifies understanding of the intermediate fundamentals of the different disciplines. This is the first belt level in which one can become an instructor, which allows him or her to teach tan and grey belt techniques with the power to award the appropriate belt. The prerequisites for this belt include a recommendation from reporting senior, and to be an instructor requires the Marine to be a Corporal or higher. Brown belt is the fourth belt level requiring 65 hours of training. It introduces Marines to the advanced fundamentals of each discipline. In addition, as with green belts, they may be certified as MAIs and teach tan through green techniques. Prerequisites for this belt include recommendation of reporting senior, rank of lance corporal or higher and appropriate Professional Military Education (PME) completed for rank (such as Corporal's Course). Black belt 1st degree is the highest belt color and requires 71.5 hours of supervised training. It signifies knowledge of the advanced fundamentals of the different disciplines. A 1st degree black belt instructor may teach fundamentals from tan to brown belt and award the appropriate belt. In addition, a black belt can become an instructor-trainer, which authorizes them to teach and award all belts, as well as teach and certify instructors. Prerequisites include recommendation of reporting senior, rank of lance corporal or above, and appropriate level of PME completed (such as Sergeant's Course or Corporals Course, and MCI's for lance corporals). Black belt 2nd degree requires the rank of sergeant or above. Black belt 3rd degree requires the rank of staff sergeant or above. Black belt 4th degree requires the rank of Gunnery Sergeant for enlisted and major or higher for officers. Black belt 5th degree requires the rank of Master Sergeant or First Sergeant for enlisted and major or higher for officers. Black belt 6th degree requires the rank of Master Gunnery Sergeant or Sergeant Major for enlisted and lieutenant colonel or higher for officers. 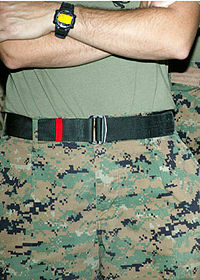 Because the belts are worn with the Marine Corps Combat Utility Uniform, the complete range of belt colors such as red, yellow, or purple are excluded as a practical consideration. Once a Marine obtains his gray belt, he can attend an additional training course (such as those at the two Schools of Infantry) to become a martial arts instructor (secondary Military Occupational Specialty (MOS) 0916, formerly 8551). "MCMAP is a synergy of mental, character, and physical disciplines with application across the full spectrum of violence." The disciplines are the foundation of the MCMAP system, as it serves a dual purpose. MCMAP was implemented to increase the combat efficiency, as well as to increase the confidence and leadership abilities of Marines. 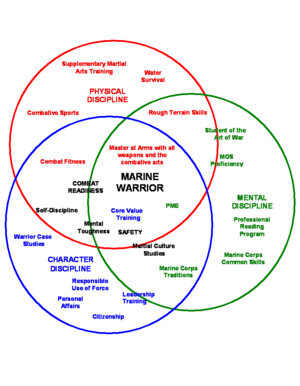 As stated above, the three disciplines of MCMAP are mental, character, and physical. Marines are required to develop the mind, body and spirit simultaneously and equally. Safety is also of importance, so equipment such as mouthguards and pads are used in conjunction with techniques such as half-speed practice and break-falls to prevent injury. Development of this discipline involves discussion on Marine Corps core values, ethics, and good citizenship. An instructor can fail a Marine if he or she feels that the student does not adequately possess honor, courage, and commitment. Some belts also require the approval of the commanding officer before awarded. The force continuum is discussed, allowing a Marine to responsibly use the minimum amount of force necessary, including lethal force. Leadership qualities are also stressed. Students must prove proficiency with 80% of 50 techniques to pass and earn their belt. The tan belt syllabus is part of The Basic School and recruit training curriculum. These men are very formidable. They can fight hand to hand. They can fight with melee weapons and their firearm skills are among the best. The Tan Belt is one of the skills that a marine individual needs to learn. In this module, marines will be taught how to use basic knife skills. Most of the time, cold steel knives and bayonets are being used. 1991 Quantico cc instructor .also taught us babies kempo. Ooooowwwhhhh!